Dr. DiStefano is an internationally recognized physician, and has been practicing medicine in the Chattanooga area for over 25 years. Dr. DiStefano is the Director and Founder of DiStefano Medical Spa where she specializes in anti-aging treatments and skin health. Patients at DiStefano Medical Spa may receive a number of medically approved cosmetic procedures including dermal fillers, Botox injections, eye lifts, and surgery avoiding revolutionary new energy based facial treatments along with a full complement of spa treatments and skin care products. During her ongoing training for the anti-aging specialty, Dr. DiStefano became extremely interested in medical treatments for hair loss. Dr. DiStefano realized that there was a lack of places for women with thinning hair to receive effective treatment, which led her to open Medi Tresse Chattanooga. While treating female patients, Dr. DiStefano observed that many women experience changes in vaginal wellness that can affect quality of life in unexpected ways. Through research, Dr. DiStefano discovered CO2RE Intima technology that created amazing improvements for vaginal health including incontinence. Dr. DiStefano is pleased to provide these treatments to the Chattanooga area. 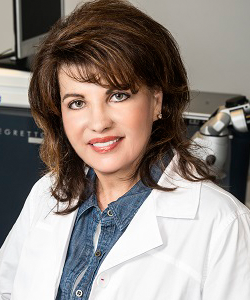 Dr. DiStefano is a Harvard trained Board-Certified Ophthalmologist. Dr. Distefano was awarded “Who’s Who in the South and Southeast” in 1983-1984, 1996-2008, 2011-1012, and again in 2013 for “Best Doctors in America” as seen on “60 Minutes”. Dr. DiStefano is featured on RealSelf.com. You may hear her discuss many topics on RealSelf.com and receive answers to your questions. Dr. DiStefano resides in Chattanooga, Tn. with her family. She enjoys her involvement with her son’s many activities including boating and vacationing on the Gulf.